Pictured are members of the NIC Basic Patrol Academy, Kootenai County Sheriff’s Office, Rod Robin staff and the Coeur d’Alene Eagles Special Olympics team at a recent “Tip-a-Cop” fundraising event. 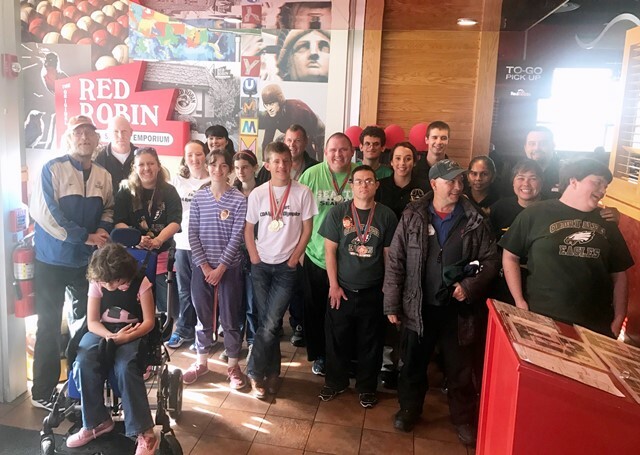 North Idaho College Basic Patrol Academy and members of local law enforcement worked with members of the Coeur d’Alene Eagles Special Olympics team and their families during a “Tip-a-Cop” fundraiser hosted by Coeur d’Alene Red Robin restaurant on Oct. 22. Every year, NIC Basic Patrol Academy students participate in a local community service project. This year, the academy students, made up of Coeur d’Alene Police officers, Post Falls Police officers, Coeur d’Alene Tribal Police officers, a Spirit Lake Police officer, and a self-sponsored student, chose the Special Olympics “Tip-a-Cop” fundraiser as their project. More than $2,600 was received from generous customers with 100 percent of that being donated to the Special Olympics for their team’s events. NIC Basic Patrol Academy provides instruction to newly hired law enforcement officers and students who fund their own academy costs (self-sponsored students). The academy offers instruction in 64 different topics from nearly 50 instructors over the 16-week academy, in which students take 11 written examinations, several practical skills examinations, and a final “POST Challenge Exam.” Successful completion of the academy and full-time employment with an Idaho law enforcement agency affords the student to be a certified as a police officer in Idaho by the Idaho Peace Officer’s Standards and Training Council with a Basic Technical Certificate issued by NIC. The student may opt to continue his or her education and earn an Intermediate Technical Certificate with an additional semester of courses from NIC. Additionally, the student earns 22 credits, which can be applied towards the Associate of Applied Science Degree if he or she wishes to earn that degree.